Maybe you’ve just purchased a brand new laptop. Or maybe you have an older laptop sitting in your closet that you’d like to bring back to life. 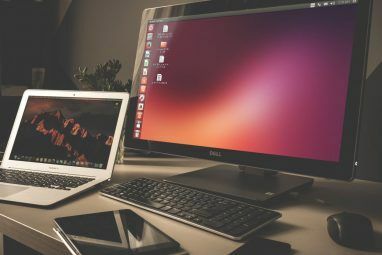 Either way, the best Linux distros for laptops are those that offer better driver support and can accommodate the performance offered by most laptops. People buy laptops for a specific purpose. That may be software development, creating graphic content, gaming, or office work. The Linux distros below are well suited to run on any laptop. New laptops come with processors How to Look Up Your Intel Processor Generation How to Look Up Your Intel Processor Generation Finding out what generation Intel processor is in your PC only involves a few clicks. We'll walk you through how to find that information and why it's useful. Read More that are just as powerful, if not more so, than many desktop computers. Desktop computers have components that can be replaced if they aren’t compatible with a certain Linux distro. That isn’t the case with laptops. Components are often soldered directly to the motherboard, so the Linux distribution you use will need to accommodate that. The Linux distros below have the best support for graphic and sound cards, webcams, wireless adapters, and more. Many are also very lightweight, which is especially suitable for older laptops. 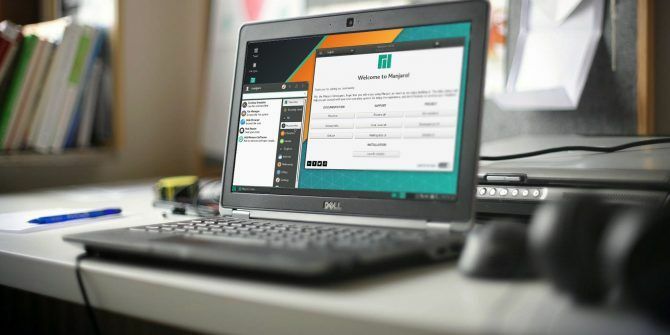 Manjaro Linux is one of the easier open-source Linux distros to learn how to use. It’s designed to work right out of the box, with a wide variety of pre-installed software. The highlight of Manjaro Linux is that it’s well known for having amazing hardware support, thanks to its hardware detection manager. Manjaro is based on Arch Linux, one of the most well-known and highly-customizable Linux operating systems. There are plenty of great reasons to install an Arch Linux distro like Manjaro. You can easily change the kernel without any complex troubleshooting. Arch Linux-based distros also let you choose your own components. This means you can customize it to suit the specific laptop you’re installing it on. And if you ever find yourself looking for support, Manjaro has a great community. You have access to the Arch Wiki, and of course the Manjaro forums. Best of all, if you really want to go full-out Manjaro, you can buy the Spitfire, a laptop created and sold entirely by the Manjaro team. 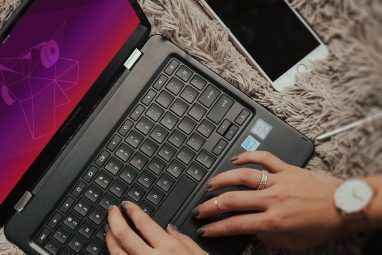 An obvious choice for the best Linux distro for laptops is definitely Ubuntu. It’s easily one of the most popular and well-known Linux distributions, which means it comes with a large user community as well as solid online support. But what makes it especially useful for laptops both new and old is the fact that it’s free, lightweight, and offers excellent driver support for most hardware. Ubuntu will usually accept any hardware you connect to your laptop. This is thanks to the fact that most manufacturers provide Ubuntu drivers. In the Ubuntu Software Center, you’ll find free apps to accomplish just about any task on your laptop. It works fine on older laptops that are a few years old, but it’s important to note that it does require more RAM than many other lightweight distros out there. So, if your laptop is very old, you may want to opt for one of the other Linux distros on this list. However, many people do believe that Ubuntu does a lot of things much better than Windows 6 Things That Ubuntu Does Better Than Windows 6 Things That Ubuntu Does Better Than Windows Some think that Ubuntu is for nerds - but the truth is that Ubuntu is just as easy to use as Windows. In fact, there are several things Ubuntu does better than Windows 10. Read More . It’s also the distro of choice for dual-booting a Chromebook with Linux How to Install Linux on a Chromebook How to Install Linux on a Chromebook Do you need Skype on your Chromebook? Do you miss not having access to games through Steam? Are you pining to use VLC Media Player? Then start using Linux on your Chromebook. Read More . All of these reasons make it a perfect alternative OS for laptops. Elementary OS is a distribution based on Ubuntu. With it, you get the beautiful, custom desktop environment known as Pantheon. Beyond the fact that it’s so aesthetically pleasing is the fact that it’s well-known as a powerful operating system that can accomplish anything you’d need to do with a laptop. And if that laptop is a low-end one that you’ve pulled out of the closet, it can run on that as well. The Elementary OS community developed the OS to be as lightweight and efficient as possible. Because of this, it runs easily on a large assortment of low-end laptops (or even desktops if you’re so inclined). It also comes with most of the drivers low-end laptops will need to start working right out of the box. The display utility includes a night light feature for when you’re using your laptop in those low-light environments like a student lounge or a library. It also provides convenient scaling, and the ability to mirror your display if you’re using your laptop to give a presentation on a larger screen. Elementary OS is considered one of the best alternative Linux distros for anyone switching over from Windows or macOS. And if you’re a Mac user, it’s especially good thanks to the Mac-like appearance of the desktop. We’ve included Elementary OS on our list of the best Linux distros The Best Linux Operating Distros The Best Linux Operating Distros The best Linux distros are hard to find. Unless you read our list of the best Linux operating systems for gaming, Raspberry Pi, and more. Read More to install, and for good reason. And if you ever run into any issues, the Elementary OS community forum provides excellent help. The Linux openSUSE distro is sponsored by major companies like B1 Systems and AMD (and of course, SUSE). It’s also popular among system admins and computer science students. Why? Because it puts you in control of many functions and services without the need to learn or memorize any complex commands. This is thanks to YaST, one of the best and most powerful system configuration tools of any Linux distro out there. This means you can easily configure the OS to suit the particular laptop system you’re installing it on. It has fantastic driver support, and works well right out of the box. It was even given a test-run by ZDNet on a brand new laptop with the latest hardware installed. They found that it worked flawlessly. With the ability to handle even the latest hardware, you can be sure openSUSE will work just as well installed on any of your older laptops. And if you do run into any issues, openSUSE provides an entire section of their Wiki devoted to helping people install and use openSUSE on laptops. Linux Mint is based on Ubuntu, but many people opt to install it instead because of how lightweight it is. It also feels a bit more familiar to people who are accustomed to the Windows user interface. It comes pre-installed with a number of things Ubuntu doesn’t install by default. For example, it includes the codecs you need to watch Flash video. Ubuntu has the option to install third-party tools for this during installation, but those options aren’t set by default. The benefit you get by installing Linux Mint rather than Ubuntu is a more lightweight OS that works on older laptops. But you still get access to Ubuntu software repositories to download additional apps and tools you might want. 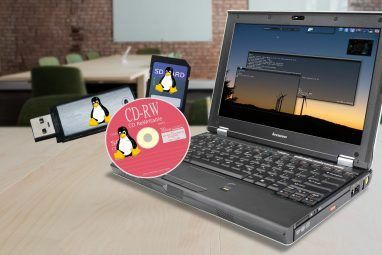 If you’re focusing on installing Linux on an older laptop, there are several important things you need to take into account. For all of these reasons, you might want to avoid Ubuntu on older laptops. Ubuntu runs efficiently on new laptops, and those that are a few years old. But if you’re considering something like an old Dell Latitude with 4GB or RAM and a vintage processor, Ubuntu could bog it down. You can’t go wrong installing any of these Linux distros on an old laptop that you’d like to bring back to life. When you’re trying to decide on which Linux distro above that you should install on your laptop, much depends on what’s important to you. If you prefer a beautiful interface with more of a macOS feel, then Elementary OS is the one you want. If you’re looking for an OS that’s extremely easy to use but still highly functional, then Manjaro is perfect. If you’re installing on an older laptop and want a lightweight OS that has the look and feel of a Windows PC, then Linux Mint is the way to go. Really, it depends on your intentions for using the laptop, and your own preferred user interface. That’s the beauty of Linux distros, there’s a flavor to suit anyone. If you’re also thinking of installing Linux on a desktop PC, make sure to read our list of great distros that’ll give any old desktop PC new life 13 Lightweight Linux Distributions to Give Your Old PC a New Lease of Life 13 Lightweight Linux Distributions to Give Your Old PC a New Lease of Life These flavors of Linux are light on CPU and RAM, meaninig they run great on older and weaker devices! Read More . Who knows, you may get so used to using Linux that you prefer it over Windows or macOS. Explore more about: Laptop, Linux Distro, Linux Elementary, Ubuntu. I have no clue what this article is about. I have used most of the distros which are mentioned and I find they are no good. I have discovered through trail and error that Fedora is literally the best Linux distro out there. Fedora just works. I have yet to experience a crash in Fedora while that is not the case with Debian based systems. Not only that, Fedora is able to make my touchpad and wifi work without a hitch. I highly recommend Fedora for a functional Linux distribution. I agree with DragonMouth, what is "best" for one person?...might be the absolute "worst" for someone else! I personally? Prefer and use Fedora in it's most "plain vanilla" version. No extensions, no add-ons....just Gnome and Firefox and LibreOffice....all the things a laptop/desktop needs to get things done. Don't get me wrong, I also have other machines with other OS'es on them. But my daily driver?...the one that has not let me down since I switched from Windows in 2002? is Fedora. I guess this list should instead be called the "Recommended" list of Linux Distros?...LoL! So do I, but tell us why you prefer Ubuntu Mate? "Best" is what you like and what works for you. There is no "best" distro just as there is no "best" beer. You may like one more than the others but that does not make it the BEST. I use the last ever released version of MEPIS on my T21 laptop. It works very well on that machine but I would never be presumptuous enough to declare it unequivocally as the "best" for laptops. Remember to consider Deepin 15.8, Debian Sid based with an attractive UI. Check out Peppermint OS. Based on Lubuntu, it is the best of several distros I tried on an old HP mini. Lightweight & complete. Good forum & support. Best is hard to define, I would use "good" in the title, and very different to different people. Best depends a lot on what you like. Cutting edge? Stable? New age desktop or traditional? I really didn't see anything in this article that would make one OS better than another on a laptop compared to a desktop. For me best is a dual boot, both with traditional desktops (I use Mate or Cinnamon). One OS more cutting edge, for watching/working with videos, music and such, one OS more stable for working with word processing, personal finance, and online form kind of things. I mean who wants a crash when filling out an online form or doing banking? Manjaro ... the one based on arch. Period. What I like best about arch is that there's less (visible) distinction between binary and source repos. I'm still finding it hard to come up with a need for which I can't find either binary or source package with the package manager. No more random searches in the browser. "Imma stop you right there, but the best is Fedora". While I prefer Fedora, there are plenty of distros for everyone's taste. I like Fedora as well but the last time I installed it there was s9me new window manager I didn’t care for much. I was a long time Mint user, but recently switched to MX Linux and I LOVE IT! I've tried at least 15 distros over the years and MX beats them all IMO....try it! Long time Linux user here! I agree with you about My Linux. I discovered lMx Linux 3-4 months ago and now I have it installed on all my machines. Very light and stable. It worked out of the box on all machines. Love it! I must agree with you. After trying several distros, I installed MX Linux in an old Packard Bell laptop which struggled and suffered under Windows 7. The installation process was absolutely painless and the laptop now works beautifully. Couldn't agree more. When I would distro hop over the years, I would always end up going back to Linux Mint as it just worked, and it was the first one I ever used. Once I have MX a go, I saw no reason to go back. I've got it on an older AMD desktop, a Dell e6410 and a Dell XPS 13. They run beautifully and I've found no reason to go anywhere else. Have to agree. Started w/ Ubuntu, then Mint, then Deepin, then Manjaro, and nany other derivatives. Been using MxLinux for about 9 months now that included a version update, both on brand new and older hardware. Absolutely flawless and stable. Package availability rivals arch systems since many manufacturers provide Deb files.